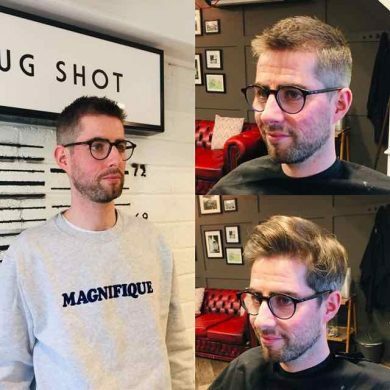 When clients come to see one of our team of Gloucester Road barbers, they can sometimes be nervous or unsure – especially if they are looking to go for a full men’s hair restyle, or to change their current look for something seasonal, different, or on-trend. We blogged recently about the free and thorough men’s hair consultation we give to all of our clients – you can read about it in full here. Ben brought a picture of the new choppy sharp cropped look being worn by David Beckham, and said that although he was happy with the long-term slightly floppy look he had, Ben wanted to go for a sharper men’s haircut. Discussing his concerns with Master Barber Franco, it was clear that Ben was nervous, but the consultation process highlighted what could be done to create a stunning new men’s haircut that would blow totally Ben away. The consultation highlighted the benefits of the new look, and after Franco delivered the hairstyle, men’s hairstyling products such as American Crew Boost Powder and EVO Cassius Clay were applied, so Ben could see and feel which products looked best for his awesome new look. Franco showed Ben how to apply and style the products, and then contacted Ben a week later to see how he was getting on with the heavy textured, grungy men’s hairstyle. Ben said that he loved the new hairstyle and the products were great for providing the hold and styling he wanted. He’d been keen to move away from the floppy long quiff to a sharper, bolder choppy look – and we delivered! If you’re not sure how to get your new look or men’s restyle done by the end of this year, why not see one of our team of expert barbers in Bristol?